Another image from the Ron Short collection, this shows officers and men of the 2nd Battalion Queen’s Royal West Surrey Regiment out at rest in the village of Berles-au-Bois, between Arras and the Somme, in early 1917. 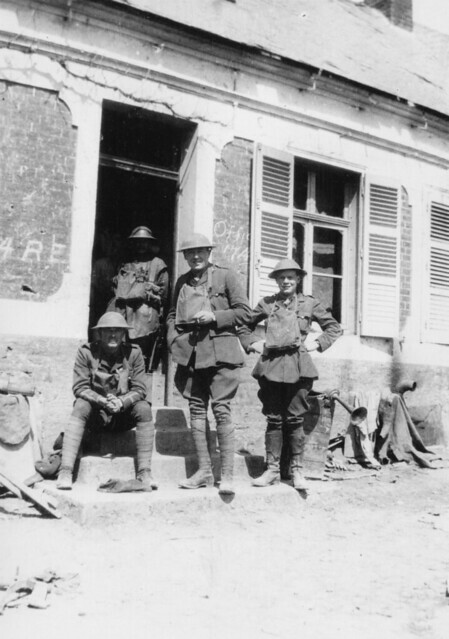 At this time the battalion had moved into forward positions at Ecoust St Mein opposite Bullecourt, and used Berles as a rest billet when not in the line. Berles-au-Bois had previously been on the front line before 1917, it being a sector taken over by Brotish troops in 1915 and well described in I.L. Read’s Of Those We Loved. In 1917 the German withdrawal to the Hindenburg Line suddenly placed the village behind our lines and largely out of the range of most artillery. On the walls of the house occupied by the Queen’s are Billet Officer’s chalk marks; they would mark buildings up so that when a new unit came in they knew which buildings were theirs and how many soldiers each dwelling could hold. Also of interest is the Strombos Horn on the wooden crate next to one of the officers: this was a very loud gas alarm and was increasingly used instead of gas rackets and gas gongs so that it could be heard above the sound of gunfire. It was powered by a compressed air cylinder that activated the klaxon noise. From 1916 onwards twenty of these were issued for every mile of front. This entry was posted on 04/02/2012 by sommecourt. It was filed under BEF, British Army, France, Hindenburg Line, Western Front, WW1 and was tagged with Berles-au-Bois, Great War, Queen's Regiment, WW1.